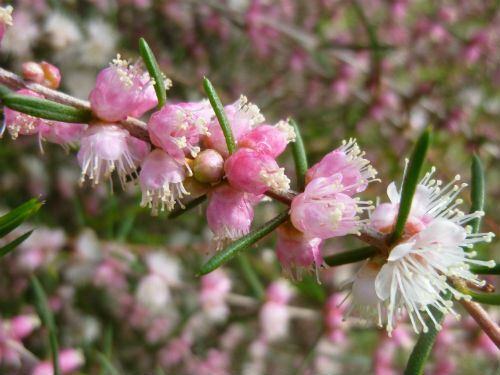 Hypocalymma is a small genus of about 29 species, all of which occur naturally only in south Western Australia. H.angustifolium is the best known members of the genus and has been widely cultivated over a long time. It is an erect shrub with narrow leaves about 25 mm long. The flowers are white or pink. See attached photos of both these forms. 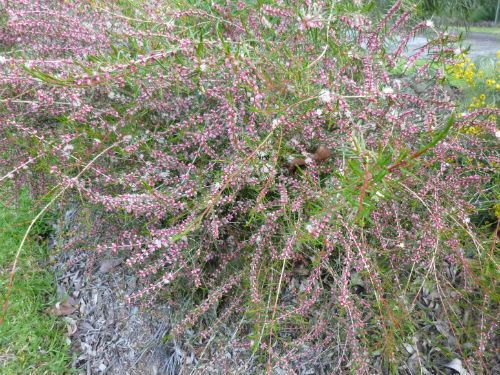 I have been growing Hypocalymma angustifolium for many years in my garden in Sydney’s northern suburbs. I find this species very attractive and was one of the first native plants that I planted many, many years ago as it was then and still is readily available from nurserys. 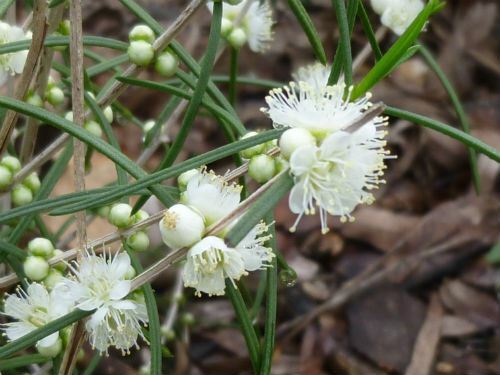 This plant is suitable for a range of climates and it is easily cultivated in humid, east-coastal areas where other species from the south west are often difficult to maintain. This makes it an ideal small plant for any garden as it only grows to 1.5 metres high and in late winter and spring the small flowers appear along the stems with 2 or 3 flowers together at each leaf axil. The flowers cover the whole plant to create a very attractive appearance. As well, it is an ideal species for use as cut flowers. The plant requires well drained conditions, in full sun or dappled shade and it is tolerant of at least moderate frost. In my garden I grow this species in raised beds over my clay sub soil as this gives me good drainage. Hypocalymma angustifolium naturally occurs in the SW corner of Western Australia and I have found they flower much better in my garden when I have a wet winter, as this is when the species naturally receives most of their annual rainfall. The pink flowering form is the most common form available from nurseries and the one I prefer. However there is also a white form available. As the plant is spectacular in flower and a bit inconspicuous the rest of the year, you should purchase the plant in flower, to ensure you are getting the flower colour you prefer. Pruning and Fertilising: Pruning back by 1/3 to half after flowering will help maintain a dense, bushy growth habit. After pruning, I apply a low-phosphorous fertiliser and give the plant a good watering to promote new growth. I only give additional watering in very dry periods. Hypocalymma...From Greek hypo, under and calymma, a veil, referring to features of the calyx of the flower; angustifolium... From Latin angustus, narrow and folius, a leaf (ie. having narrow leaves).